George Mason outscored Kansas State by 19 in the second half and had a chance to win it with under 10 seconds to go, but the Patriots could not quite complete the comeback, falling 59-58 Saturday night in Bramlage Coliseum. Mason trailed 36-16 at the half, but held a +19 (42-23) edge in the second half to nearly pull off the upset over the Wildcats, who were the second team out of the AP top-25 this week. Mason outscored K-State 15-4 over the final 5:32 of action. The Patriots shot a much improved 55.2 percent (16-29) in the second half and limited K-State to just 39.1 percent (9-23). Ultimately, Mason was victimized by a six-minute stretch to end the first half, where the Wildcats were +18 (20-2) to end the half. Mason turned the ball over just five times in the game and held a 30-22 edge in points in the paint. The Green & Gold also were +8 (15-7) in points off turnovers. Junior Justin Kier led Mason with 15 points, while sophomore Javon Greene added 12 points and seven rebounds in 25 minutes. Redshirt-junior Jarred Reuter posted 11 points, eight rebounds and three assists while making 5-of-8 field goals in a solid all-around effort. K-State jumped out to an early 10-5 lead and increased the edge to 16-7 at the 12:28 mark of the first half. 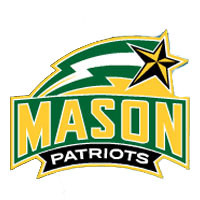 Mason stormed back with a 7-0 run – including two baskets from Jarred Reuter – to move back within two (16-14) with 9:01 to go in the stanza. The Wildcats then held Mason without a field goal over the next three minutes while hitting back-to-back triples to extend the edge to double figures (25-14). In all, the Wildcats used a 20-2 run over the final 6:48 of the half to take a 36-16 advantage into the break. Mason had trouble hitting its shots and went 1-of-10 from 3-point range (.100) and 7-of-27 (.259) overall in the half. Mason moved within 17 on two occasions early in the second half, but the Wildcats pushed it to 21 (44-23) at the 15:07 mark. Back-to-back 3-pointers from Jamal Hartwell II and Justin Kier fueled an 8-0 spurt that pushed the Patriots back within 11 (46-35) with under 10 minutes remaining. Another 8-0 run, including five points from Otis Livingston II, got Mason all the way back to six (49-43) with 6:51 to play. Livingston II nearly grabbed a steal on the next K-State possession, but Kamau Stokes recovered and hit a difficult 3-pointer. Stokes again converted from deep on the ensuing trip and K-State was back up 12 (55-43) with under five minutes left. But the Wildcats could only manage four points the rest of the way. Mason surged back with a 10-1 run to cut the lead to just three (56-53) with 1:50 to go. The spurt included five points from Greene. Stokes hit his fifth 3-pointer with 1:21 left to put K-State back up six (59-53), but Mason answered right back with a Reuter 3-point play to get it to 59-56 at the 1:07 mark. Kier stole the ball on the other end and Greene converted a lay-in to cut it to one (59-58). Mason earned a stop with 17 seconds left, but a runner from Kier rimmed out and K-State gained possession with under five seconds. But a Barry Brown Jr. double dribble with 1.2 seconds to play gave Mason a final chance. The Patriots could not convert and K-State escaped with the win. Stokes finished with 20 points for the Wildcats. Next up, the Patriots open Atlantic 10 play on Thursday (January 3) with a contest at Saint Joseph’s. Tip-off between the Patriots and Hawks is set for 7:30 p.m. The game will be televised nationally on CBS Sports Network.